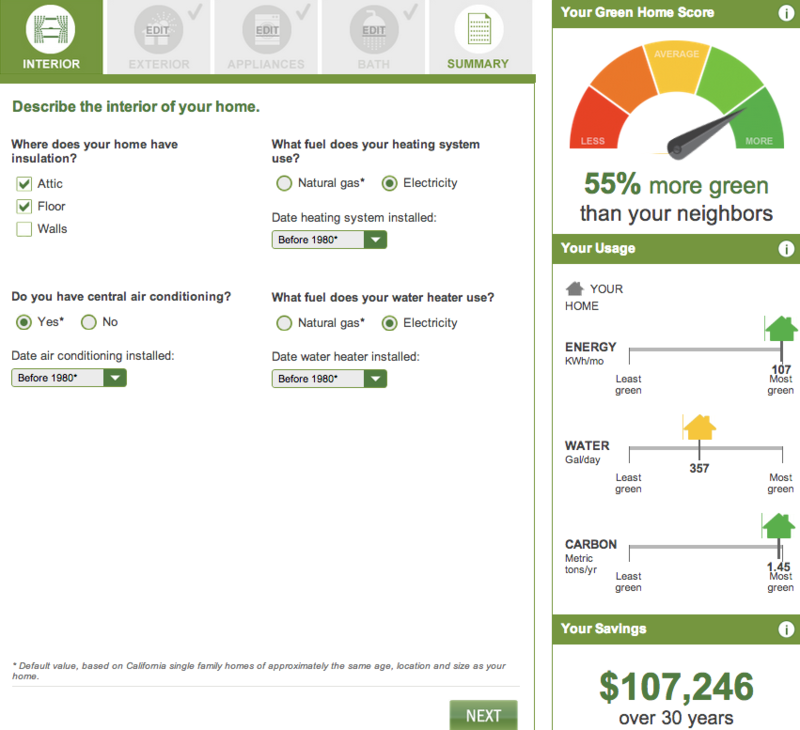 Build It Green, a California-based nonprofit, has created a new home energy calculator that shows you how much greener your home is compared to your average neighbor’s home. It also shows you how much money you save compared to your neighbor. Even if I say I don’t have central air conditioning, don’t have a dishwasher, don’t have a refrigerator, don’t have a washing machine, use 100% green (CFL/LED) lighting, and have insulation everywhere possible, I only get up to 29% greener than average (and $87,530 savings) without the solar panels. In the solar situation above, I have all of those appliances and don’t have insulation in my walls. In both situations, I put that I had electric heating and water heating. With heating and water heating coming from natural gas instead, and all other variables except the solar panels at default, my home is 26% greener and I save $18,891 over 30 years. Default, of course, has me at 0% and $0. Anyway, as you can see, this green home or energy calculator is a lot of fun to play with. The options to change variables are tremendous. Go ahead and give it a shot, especially if you live in California. But the big conclusion is that solar panels are the best way to green your home (without removing just about every modern amenity in your home), and that’s especially the case if your heating comes from electricity.